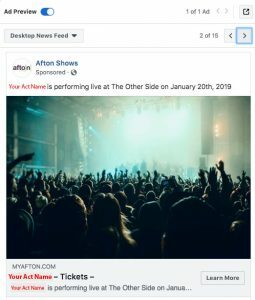 If booked for an Afton show, as soon as you sell 10 Tickets in advance we will launch and pay for (on our dime) 4,000-10,000 Facebook Ad impressions specifically promoting your act! This is free exposure we want every Afton artist to take advantage of. *Depending on your city’s population, you’ll get 4,000-10,000 Facebook Ad impressions. That means 4,000-10,000 people will see your ad. Larger cities see higher impression results. DOES IT COST THE ARTIST ANYTHING? No. Afton pays for these ads. One of our ad specialists creates your ad and launches it. You don’t have to do anything. We’ll email you once your ad launches with an attached screen shot example of what your ad may look like. WILL YOU SEE YOUR AD? Possibly. Facebook delivers these ads to music fans. As you know, Facebook has thousands of people in your city this ad could be served to. 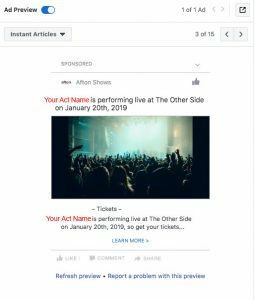 So you or your members may not necessarily see the ad, we have no way to make Facebook show the artist their own ad unfortunately. But your ad will be ran until it’s been seen by 4,000-10,000 people. WHAT DO THESE ADS LOOK LIKE? Here is an example of what your ad may look like. It will display your Act Name. 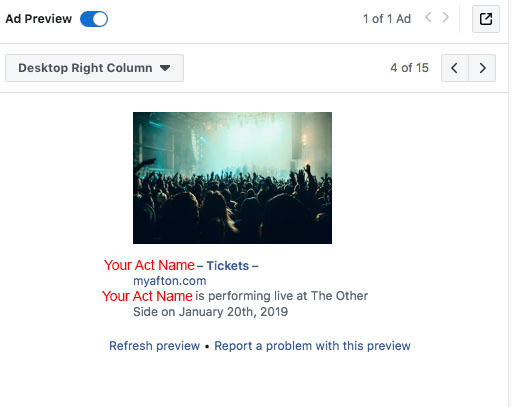 We’ll use an image from the flyer you created, or if your image does not meet Facebook’s image specifications we will choose the image for your ad. HOW ELSE DOES AFTON PROMOTE?